Looks: This is a deceivingly dense little bud. It is coated with long thin trichomes, and has dark red hair coming out everywhere. Smell: Initially this bud smelled slightly of incense or perfume, but upon grinding that changed to more of a sweet scent, along the lines of strawberry licorice. 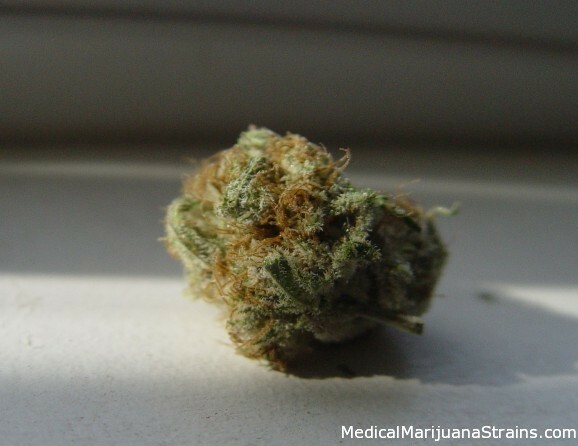 Taste: Contrary to the scent, this bud tastes much like a cold lemonade: the kind that the flavor is so sweet and sour that it kind of sticks around in your mouth. I am also getting a slight undertone of a kind of earthy plant flavor. Effects: Instant pain relief. I do feel a bit hazy in my head, but my thoughts seem to cut through the cloud, and movements seem un-slowed. That all being said, it has a very nice body buzz that, when combined with the cloudy headed feeling, makes for an incredibly comfortable overall buzz. Just sitting back and feeling the buzz, is like sitting next to a nice warm fireplace on a cold night. Potency: The comedown started at hour two and lasted until about hour five, so I’d give this one an 8 out of 10 on potency. Good Strain For: Great medical bud for night time use or to wind down and relax for a couple of hours.